Let’s face it…receiving, sorting through, and distributing postal mail is a pain. And with the rise of remote and distributed teams, sometimes it isn’t even possible. Earth Class Mail was created to alleviate that pain, but it’s become that and so much more. While many businesses today embrace ideas such as going paperless and efficiency for distributed teams, this company was founded over a decade ago and before those ideas were mainstream. In a world where 92% of startups fail in the first three years, what is Earth Class Mail’s secret to success? They owe a lot of their success to building a great product, pivoting when needed, and bringing in veteran executives to help scale. Before we dive into how they’ve achieved all that they have, let’s take a quick look at where the company began. “Dealing with real, actual (snail) mail isn’t very much fun. An endless and prodigious trail of junk mail comes through our mailbox. As a country we get over 200 billion pieces of mail a year. Remote Control Mail is the first company to try to solve this problem for us by virtualizing our real-world mailbox,” founder Rob Weiner told TechCrunch in 2005. In 2007 Document Command and Remote Control Mail rebranded the company and services as Earth Class Mail. While the company was built on a great idea and received significant venture backing, they hadn’t anticipated how incredibly expensive digitizing all that paper mail would be. Funding ran out when the recession hit and the company wasn’t able to recover and become profitable. In early 2015 Earth Class Mail declared Chapter 11 bankruptcy and shortly thereafter was acquired by noted technology investment firm Xenon Ventures. Enter Doug Breaker, who was brought on by Xenon Ventures as the new CEO of Earth Class Mail. We sat down with Breaker to talk about how the company has pivoted in the last two years to become a wild success, lessons learned as they scaled, and where they’re headed. Breaker is quick to give kudos to Earth Class Mail for “building a super valuable product and service.” Today, the company remains focused on taking away the pain of a physical address and providing reliability, efficiency, and security for customers’ mail. Early on, there were some comparisons of their virtual mail services to mail services provided by business centers. They aren’t even in the same league. Utilizing a business center means time delays if mail is forwarded from the center or someone has to physically pick up the mail at the center (not efficient or convenient). There also isn’t any security or reliability — a receptionist simply sorts through the mail. You choose an address (PO Box and street addresses are both available) from their network which includes many cities across the United States. Earth Class Mail scans your unopened mail. open and scan it (to be conveniently viewed online). You’re only charged for the scanned mail. In the beginning, the company targeted consumers such as frequent travelers, expatriates, retirees, and students. Following the acquisition, Earth Class Mail has pivoted to a B2B model. We’ll admit the last point surprised us. Why would a traditional office with a physical location use virtual mailroom services? 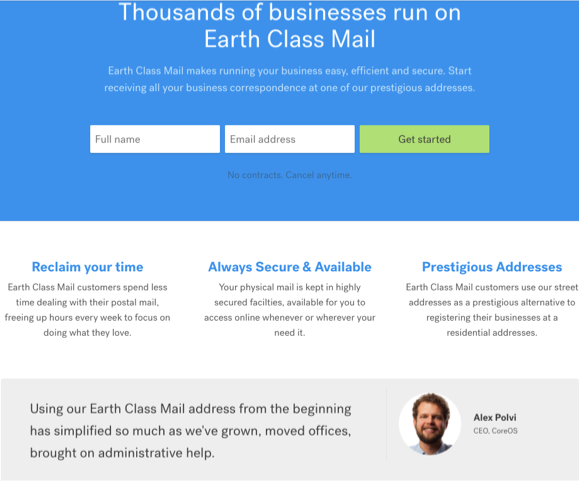 Because Earth Class Mail’s services act like “a combination of an assistant, a lawyer who has your back, and a great office manager for companies who like a ton of convenience, security, and reliability around their mail,” explains Breaker. For instance, Know Your Company is 100% remote and their CEO, Claire Lew, is frequently on the road. Earth Class Mail’s check deposit feature removes the hassle of cashing checks that clients mail in and Lew loves never having to physically pick up her mail. Yes, Earth Class Mail can even deposit customers’ checks! Customers can opt to have checks deposited via mail or electronic transfer and the digital scans of the checks can be linked directly to their accounting software. Consider the time sensitive, confidential information sent via physical mail to professionals such as attorneys, accountants, and wealth managers. For those types of businesses, Earth Class Mail’s strict security standards and HIPAA compliance are game changers. Additionally, by outsourcing the scanning of mail to pdf’s, automatic check deposits, and secure paper shredding, businesses are able to streamline their back office to save money and utilize internal staff resources on other priorities. Immediately following the acquisition, it was important to get the entire team “on the same page about what Earth Class Mail was going to be,” explains Breaker. Along with pivoting from B2C to B2B, new executives were brought in for sales, marketing, and product development. “We came into a company that had a really valuable product already, but they hadn’t done significant sales, marketing, or product development in a few years,” says Breaker. Change is difficult for everyone, and acquisitions can leave veteran staff concerned and uncertain. How does a new executive team move employees from uncertainty to excitement about a new day and the future of the company? Communication and ultra transparency were key to creating a culture of trust. Initially, executives had numerous meetings with team members — often over coffee or lunch — to answer questions, listen to feedback, and get to know everyone better. Focusing on having accurate metrics was a priority. Stats such as leads generated, signups, and churn are posted daily in Slack so everyone in the company always knows the current state of the business. In fact, stats from every department are posted publicly for the entire company every day. “We believe in laying everything bare to everyone so you can see what’s working and what’s not. I find it best when everyone is pulling in the same direction and operating off the same information,” says Breaker. Breaker also shares important company news and strategy with the whole company every week, via the communication tool Know Your Company. Once the company was aligned, they could focus on improving efficiencies and scaling. Anything which fell into the Non-Strategic and Non-Critical the company should disregard; it didn’t need to be part of their business. “The chart was a great way for everyone to understand ‘if it isn’t critical and strategic, we shouldn’t be writing code for it’,” says Breaker. At the time Earth Class Mail (then Remote Control Mail) was founded, there weren’t many SaaS products available. Which meant the company built everything internally. “Earth Class Mail had homegrown billing, homegrown email delivery, homegrown file storage, a homegrown customer service app…homegrown everything,” explains Breaker. In order to scale Earth Class Mail successfully, executives spent over a year replacing the non-strategic, homegrown systems in order to be able to focus on “the things that matter” for their customers. For example, the company moved from their internal ticketing system to Zendesk and from their homegrown billing system to Chargify. Finding a comprehensive recurring billing solution was mission critical because “a ton of what we do is usage based. If you ship something out there is a charge on the number of pieces that you shipped plus we have to add in the shipping charge. Or, we charge based on the number of scans and then the number of pages per scan,” explains Breaker. We looked at several SaaS billing platforms, but none came anywhere close to the robust way Chargify handles metered components. If we had used any other system, we would have had to write the code ourselves to handle our usage based billing. Using Chargify has eliminated the need for a full time developer (or two) to maintain our complex billing needs. Focusing exclusively on Earth Class Mail’s core business goals (i.e. 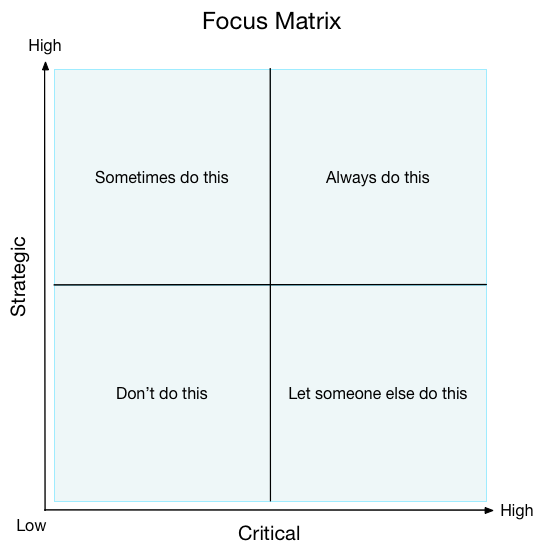 those things that fall into the strategic and critical category) has been “transformative” for the company. 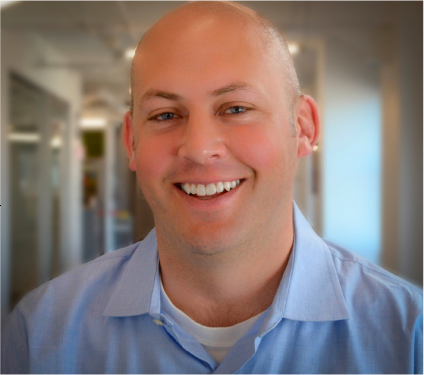 They’ve grown their MRR more than 50% since Breaker started with the company! So, what’s next in the company’s transformation? 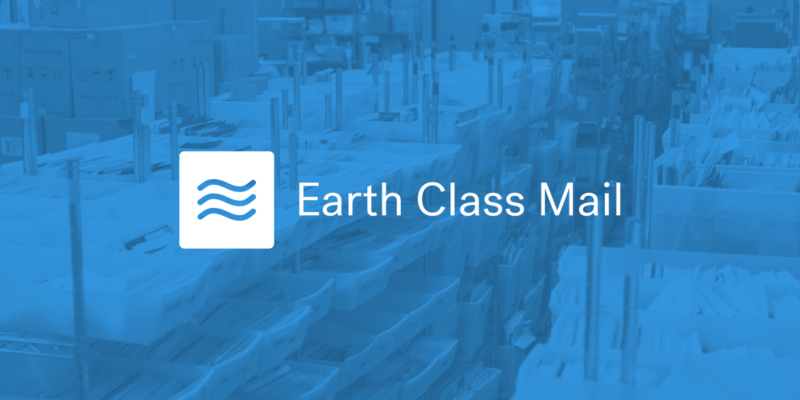 After spending the last year and a half moving away from their homegrown solutions to 3rd party tools for everything that didn’t directly relate to their core business goals, Earth Class Mail is now in place to begin shipping out exciting new features to customers. Within the next few months, the company will be releasing an improved check deposit product. Customers will still be able to have Earth Class Mail deposit their checks via mail or electronic transfer, but the new release will provide a faster, more convenient deposit option. Earth Class Mail customers can also look forward to an expanded address network. “We should have an address in every major city by the end of the year,” says Breaker. Their product roadmap includes “a ton of super valuable, new features that help businesses operate more efficiently.” Imagine, one day in the near future you could have the ability to sign an electronic piece of mail and then fax it or send it back out through the mail. In the future, the company also looks forward to releasing an amazing new Earth Class Mail user interface. Companies across all industries are moving to being able to manage the majority of their business online. A paperless word is no longer unbelievable or even unfeasible. It’s exciting to see Earth Class Mail at the forefront of the digital mail revolution and virtual mailroom services. We can’t wait to see how the company continues to grow, succeed, and make the lives of business owners everywhere a lot easier. For more information about Earth Class Mail check out www.earthclassmail.com or sign up for a no-risk trial.